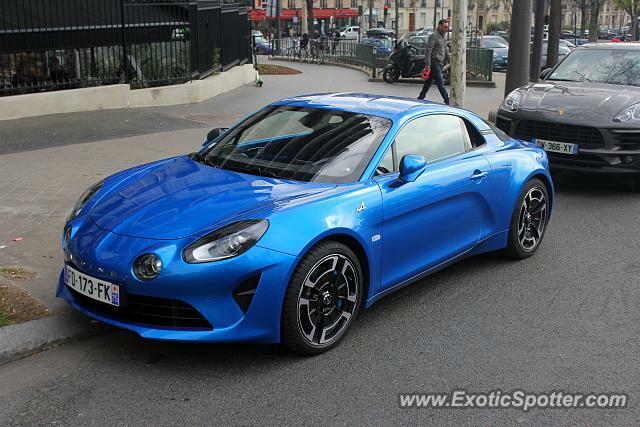 I spotted this brand new Alpine valeted at a restaurant "porte d'auteuil". For those who like tennis, the roland Garros tennis courts are about a block away from where I spotted the car. You will see dandude999, Paris is an awesome city for car spotting and of course sightseeing. I hope you will have fun. If you need any information about car spotting or anything else let me know. I can give you some tips. @dandude999 Thanks. I see amazing cars in Paris every single dy of the year. I am myself amazed by the amount of rare cars I can find. However because of the riots there are less cars to spot on saturdays (the riots are only on saturdays). Sundays and week days are fine. Just those saturdays are annoying because rich people don't dare drive their cars in Paris. Exotic car owners will drive their cars in other neighbourhoods of Paris outside of the Champs Elysées in order to be sure to not have any problems. For example this Alpine has been spotted 10 minutes away from the Champs Elysée at the same time as the strike was going on. Same thing for that red Ferrari 488 Spider I spotted in front of the Flandrin restaurant. Otherwise sundays in Paris are just amazing for car spotting (and sightseeing). I see so many exotic cars I get tired of spotting most of them to be honest. We are lucky in Paris, because most of rich French people live here and own amazing cars, but also because many foreigners drive their cars down to the city (we see many cars from England, Germany, Switzerland, Belgium, Luxembourg and in the summer the rich arabs bring their cars to France). In 2018 I also saw a couple of amazing cars with american licence plates drive in Paris (Mclaren SLR convertible, Rolls Royces, McLarens...). How is Paris for car spotting right now as well as sightseeing as I am thinking of going in April but the riots are putting me off?